Is there anything more subtly perfect than a Silver Porsche 356? It might not possess the visual drama of a Jaguar E-Type or a Ferrari Lusso, but there's something that's just so right about a 356. There isn't a single detail that's out of place. This particular 356, owned by one Mr. Jack Griffin (who also owns this 914-6), is a particularly special one, with some tasty modifications. It's a 1955, badged as a "Continental," thanks to Porsche importer Max Hoffman who thought US Porsches would need some sort of conventional name. Ford evidently didn't think this was such a great idea, since they sold the Lincoln Continental, so they requested Porsche to stop. 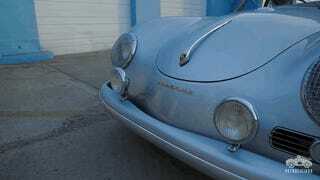 Consequently, only about 1500 other 356s, all sold in 1955, wear that badge. The engine was replaced with a '65 356 engine that produces 115 HP mated to a gearbox from a '62 356. 115 horsepower doesn't sound like a whole lot, but it's a ton of power for a car like this. Griffin also fitted disc brakes, a set of Fuchs wheels, a louvered engine lid, 12V electronics, and the gas filler is through the hood. The aim was to make it look like a period correct race car, and I think they absolutely nailed it. Griffin notes that while his car feels a lot more modern than a stock 1955 356, the handling is still pretty hairy, demanding your full attention. Generally, I've always been a bigger fan of later 356s like the 356C because I feel their design is a little more modern while still remaining ostensibly classic, but this '55 is really winning me over. I could just be falling for the ever lovely camera work of Petrolicious, but this car looks so perfect, especially in silver.